Most of the features work as expected. On the retina display of the computer I used, I had to increase quite a lot the default font-size in settings to have something usable. So you might have to do that as well (Preferences > Views > Text Editor > Size). 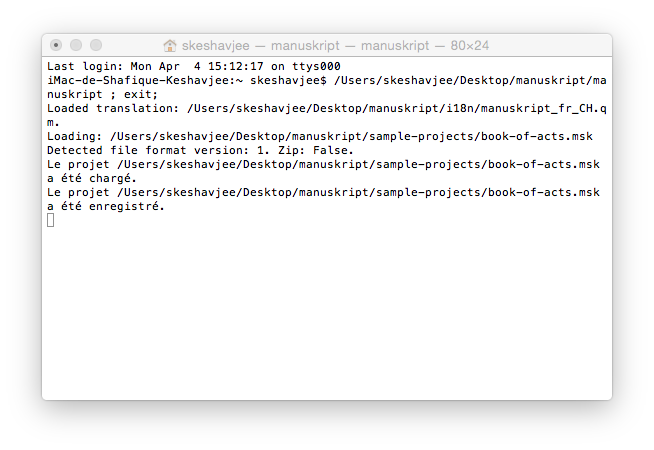 Download manuscript-0.3.0-osx.zip, unzip it (double-click), and the newly created manuskript folder. It contains a lot of files. Find the one name manuskript and double-click on it. You’ll see that, as in the windows version, when you run manuskript, a terminal opens up. This allows errors to be reported more easily, as manuskript is in a beta phase. You can just ignore it, most of the time. I also made a quick guide for those who’d like to run manuskript from source. This allows to test the latest version, contribute to developing, etc. It take about five minutes to install all the necessary dependencies. Manuskript looks really awesome and I would love to give it a try. But I downloaded it three times on Mac and proceeded as mentioned above. Then it says, Manuskript default (or something like that) and that I should put it in the trash. Any advise? I would be very thankful. I don’t own a mac so it’s more difficult for me to test it there. And I need more informations. Who says what? Can you post a screenshot maybe? 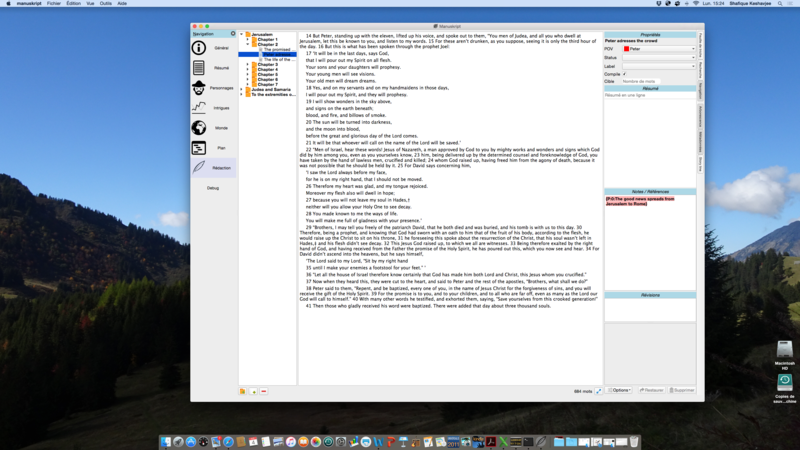 Try right-clicking the executable and opening the application from the contextual menu. If that too fails you’ve got your security preferences set too high. Sorry for you work loss. Manuskript is not stable yet, as you have realised. But come back later ! it sounds like you are decompressing the zip file multiple times. try opening the enclosing folder in list view, and then using the down arrow to open the folder within the same window… then it should reveal the contents of the folder in a listing below it. sort by kind, or hit the letter ‘m’ on your keyboard- it should automatically hilight a Unix Executable file. that’s the one you want to double click. Wow, I can see the amount of problems people are having with this software. I guess I have to pass on that. Manuskript is new and still under development. Issues can be created and tracked at the Manuskript github issues page. …Any idea what happened or how to fix it? Would really like to try this program but I can’t get past this. to bad, crashes all the time on Mac. Impossible to create a new project. There was an issue with creating new projects in version 0.3.0 that is fixed in 0.4.0. I clicked it something so that Manuskipt is in full screen. How can I get it back to the normal screen? Escape. Or move the mouse to the top or bottom edge of the screen, a panel should appear with a button on the corner. enchant.errors.Error: No tag specified and default language could not be determined. There were a number of problems in version 0.3.0 such as an issue with creating new projects that are fixed in 0.4.0. Can you tell me what this means? Should I put the app in the Applications folder? Hi thanks for the mac version. It looks promising. However, when I follow the instructions above all I get is this terminal message…any idea on what’s wrong? and i cant get in fullscreen mode on windows with version 0.4.0 what do i have to do? I’d love to use manuscript but am unable to open it. what do I have to do to make it work? 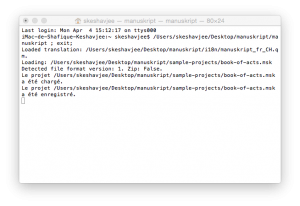 To use Manuskript on Mac OS X, Download the file named manuskript-0.7.0-3-osx.zip and follow the instructions on the download page to unzip the file and then run it. @annoporci it is difficult to help you unless you provide more specifics. For example what does not work with the OSX version? What version of OSX are you using? Can you unzip the file? 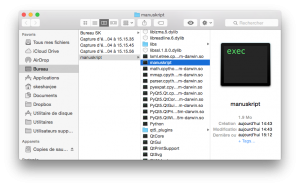 Can you locate the manuskript executable within the extracted manuskript folder? 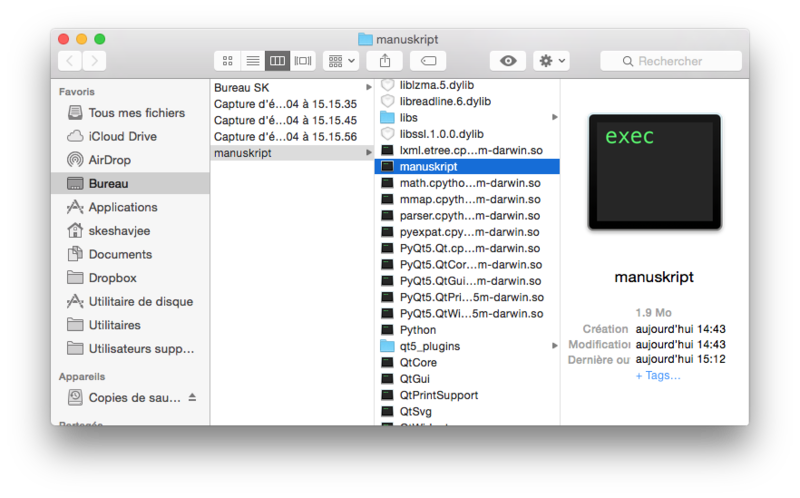 Can you initiate manuskript by clicking on the manuskript executable? Can you post the console output from running manuskript?